Hello everyone, I've just started to do custom dolls and wanted to share my first complete project. 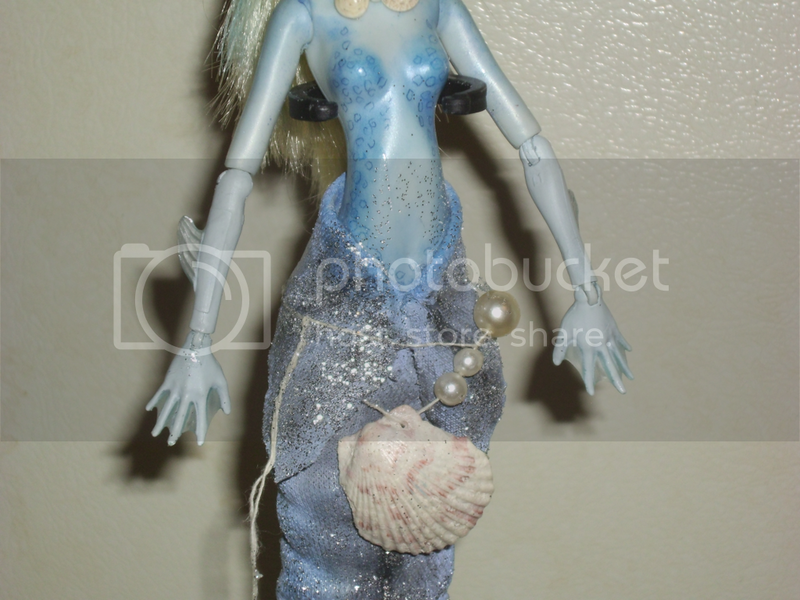 Though I have a few other dolls laying around half painted, I thought this project wouldn't take as long. No need for much cutting and sewing, so I would have results faster. 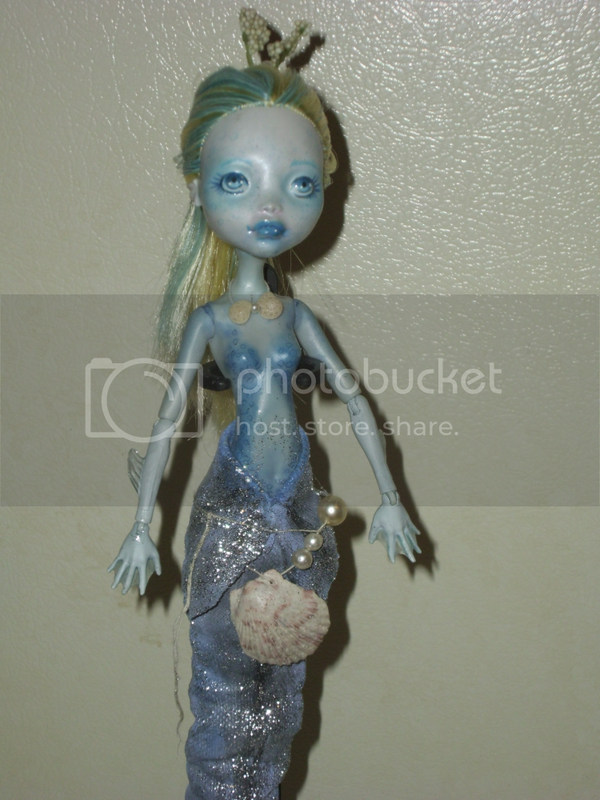 My first decision was to keep Lagoona's hair. None of the yarn colors I had available really seemed "Lagoona", so I just decided on a simple styling. Of course, I used similar methods as everyone to actually do her face up, so let's not bore you all on the details. The fun part is the tail, I had to remove both of her legs from the knees down. Using tin foil sheets, I managed to shape a basic mermaid tail, before wrapping wire around it, so the tail has more flexibility than the mermaid dolls you find on the market. Her fins include wire for some flexibility and some packing to keep their shape. The seashells are real, compliments of Myrcury and the rope is packing twine. The hair piece is a sprig of plastic berry bush with a pearl base, it's kept attached to the scalp with a simple pin. 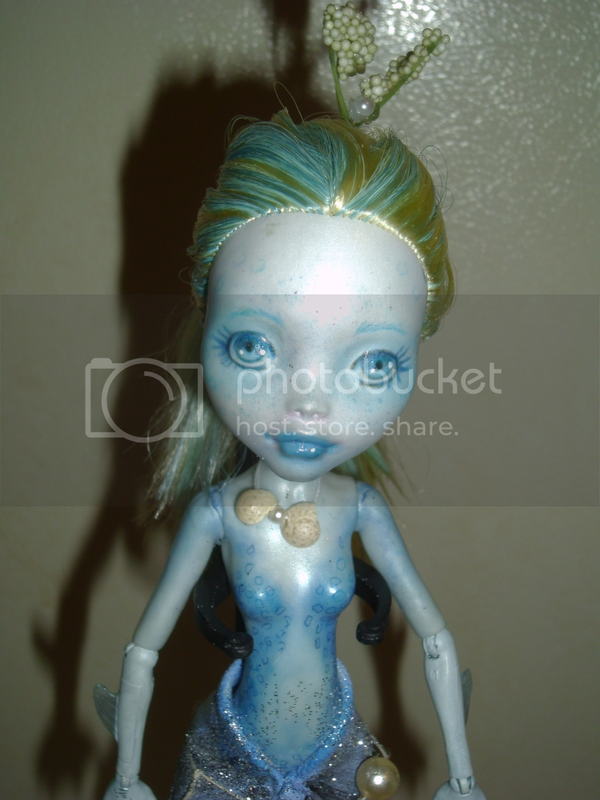 Oh, her skin is shiny, because I added a gloss varnish on top of the completed faceup, once the top coat dried. I wanted her skin to appear "moist." Anyway, it's my first completed doll and I kind of wanted to show her off. Enjoy the photos. Check out my etsy shop for cute custom doll outfits. 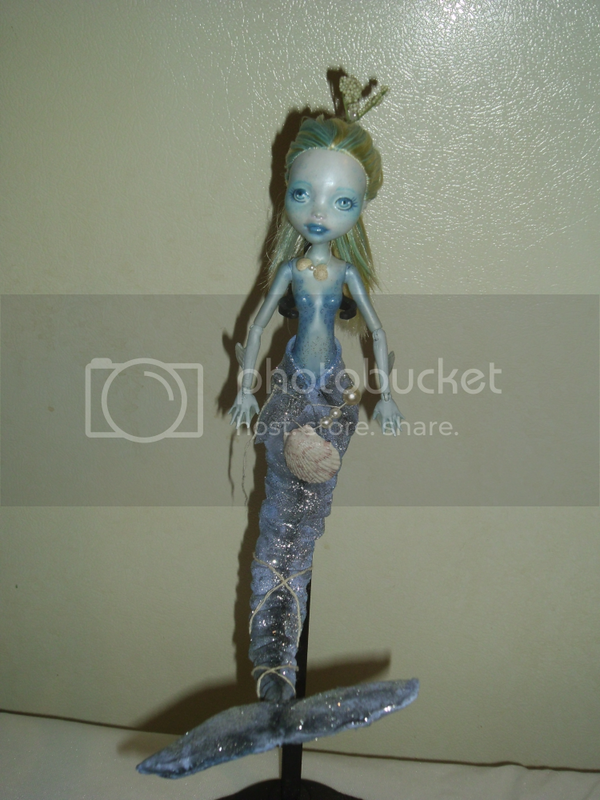 You've already heard me gush but - This is a really great first custom dolly! Lots of great details, the face is nice and straight, the colors are strong and well matched... Good stuff all around, you should be well proud! Congrats! I particularly love her torso design…very nice! I'd love to see a pic of her 'posed' - like on a rock or shell or something? With her tail waving about? Sadly, I don't have anything like that. I'm going to try and look around though. Maybe mock something up. Just don't want to risk getting her dirty, since I plan to sell her, though if I can get to my brother's property, I might be able to go down to the small creek running alongside the property line. We will see! My name isn't Lisa, but thank you for the compliment. Mine name is Tina. Oh yeah, don't get her dirty! Maybe a pretty dish or something? Just so she's posed and not on the stand. awesome first custom , i am trying to start on my first custom, but kinda scared it will not turn out at all good. I am sure when you sell her she will get bought up right away. Very nicely done. I love the scale design on her chest. Great work!